← Thank God for Friends – there when you need them. Not only is the Italian wine selection impressive at the store, but Bordeaux also has its fair share of excellency here. The usual suspects are not here though. You won’t find any Château Lafite, Latour, Margaux or any other first growths here, but 3rd-5th growths that are just as amazing can all be found on the shelves, and I’m rather proud of the selection. Some of my distributors carry more than others, and some have a definite affinity for the region, so futures are offered and I usually tap into that. 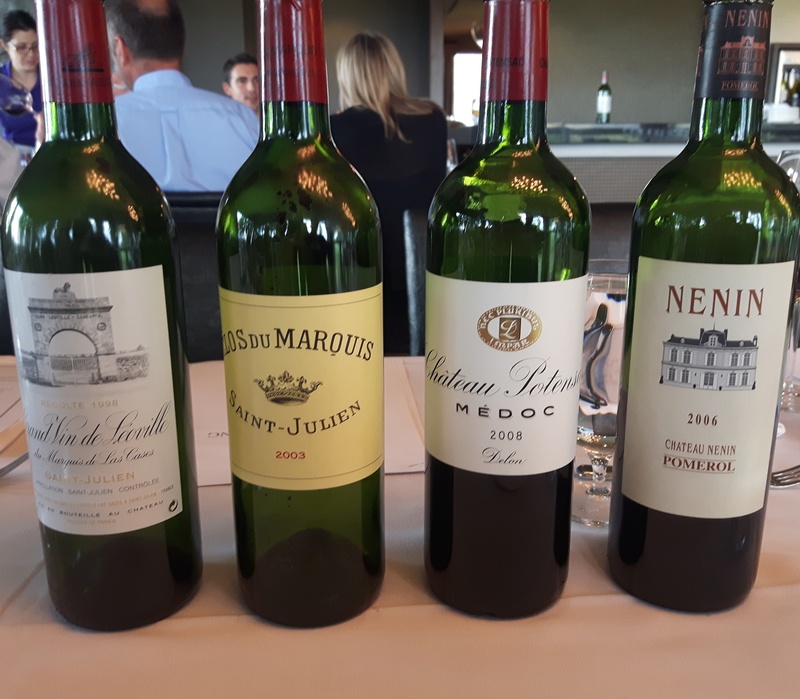 When I get invited out for lunch with export manager Florent Genty of Domaines Delon, I don’t say no…especially when I get to taste aged Bordeaux. No, not 20 or 30 year olds, but at least a 19 and 14 year old, and from both banks too. Needless to say, the wines did not disappoint, and the food was pretty amazing too. 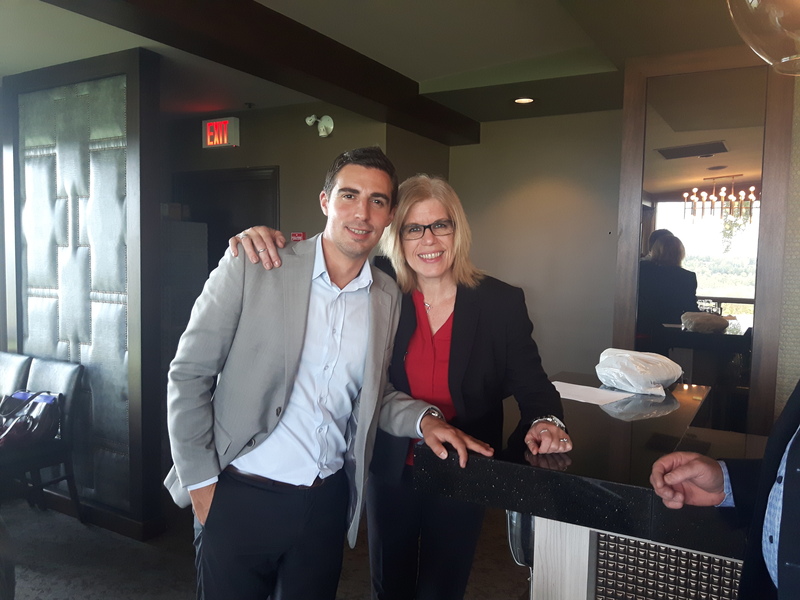 Thanks to the Edmonton Golf & Country Club for putting on a gastronomic cornucopia for this small intimate group to pair with the wines. And thanks to Lanigan Edwards for bringing in these fabulous wines to share! An Italian Sausage Ravioli was up first, and pairing it with the 2006 Château Nenin from Pomerol. This estate has been owned by the Delon family since 1840, and is considered to be one of the top wines from Pomerol. In fact, it has long been a favourite of the Royal Family, something to boast about indeed! The estate is planted mostly to Merlot, with small parcels of both Cabernet Franc and Cabernet Sauvignon. The 2006 Nenin has 76% merlot with 24% cabernet franc. Hints of black cherry and cassis were surprising, but welcome, along with earth, mushrooms, cedar and beetroot. Somewhat austere on the palate, but smooth tannins and more earth and black fruits on the palate along with hints of spice and dark chocolate. Life left in this bottle for sure! The second course featured fresh garden beet salad with lobster medallion, paired with the 2008 Château Pontensac from Médoc. Not a fan of beets, but I certainly cleaned up everything else on my plate, and admittedly, the wine with all it’s earthiness was a nice match for the one tiny piece of each beet colour I DID try! This Cru Bourgeois was certainly showing all of the grape varietals within as the 42% merlot, 40% cabernet sauvignon and 18% cabernet franc exhibited black fruit, softness, some earth and vegetal notes with an austerity that would most likely be from the high levels of limestone soil the grapes are grown in. 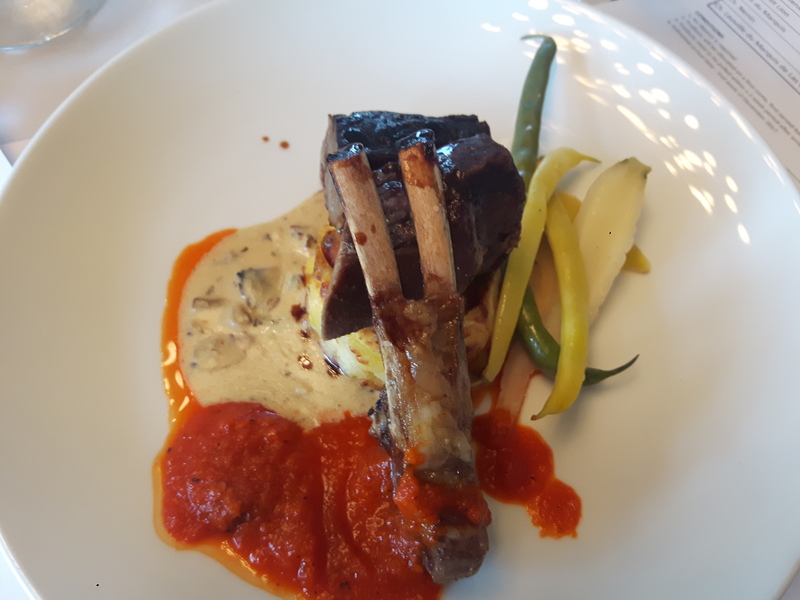 Our main dish featured Alberta braised short ribs along with a grilled lamb lollipop. For a meatatarian such as myself, a good deal of protein to stick to my ribs and keep me going for the day! But not only that, a real liquid feast as well: 2003 Clos du Marquis and the 1998 Leoville du Marquis de Las Cases from Saint-Julien were our wine pairings for this dish. Um…wow. Florent was very specific in his vintage picks: pick some of the inbetween vintages that got lost in the shuffle of the greats of 2000, 2005, 2009 and 2010. Some have said that the 2003 Clos du Marquis is past its time. To that, I say a resounding “NO”. These vineyards were planted in 1902 in a mixture of clay and sand with a forest reserve close by. And 2003 was the the warmest recorded vintage in 20 years with record breaking temperatures of between 40-45°C for 3 weeks +. For younger vines, this usually proves tragic, (no irrigation is allowed by law) but for those older vines with deep roots on great terroirs, although lower yields, were simply outstanding. It helps that there is 54% cabernet sauvignon in this wine along with 3% petit verdot, with the balance being merlot. All that great structure is keeping this wine drinking beautifully! For me, this was the most complex, bringing notes of cedar, cassis, menthol, red plums and dried flowers, all with (still) fresh medium plus acidity and silky medium plus tannins also. If that wasn’t enough, the Leoville at 19 years of age was truly just beginning to shine. This second growth estate is located on the northern end of Saint Julien adjacent to the Gironde river, and like its next door neighbour Château Latour (a first growth of the 1855 Classification), they have an extraordinary reputation for making stellar wines, even in difficult vintages. By all accounts, this château of Leoville Las Cases is a jewel in the crown of Bordeaux and perhaps one of the best wines of the region. This inbetween vintage (in the middle of the great 1995 and 2000) of 2008 stood out with lots of ruby colour in the glass, huge tannins that still have time to open up and mature. The fruit was starting to indeed move into that “stewed” stage, but lovely aromas of plum and cassis nonetheless along with bark, forest floor, truffle, cigar box and hints of menthol. The blend of 76% cabernet sauvignon, 15% merlot and 9% cabernet franc was a standout match with the shortribs, and most especially the lamb. What a treat to be tasting and enjoying these wines! And what’s a Bordeaux tasting without an encore of Sauternes? 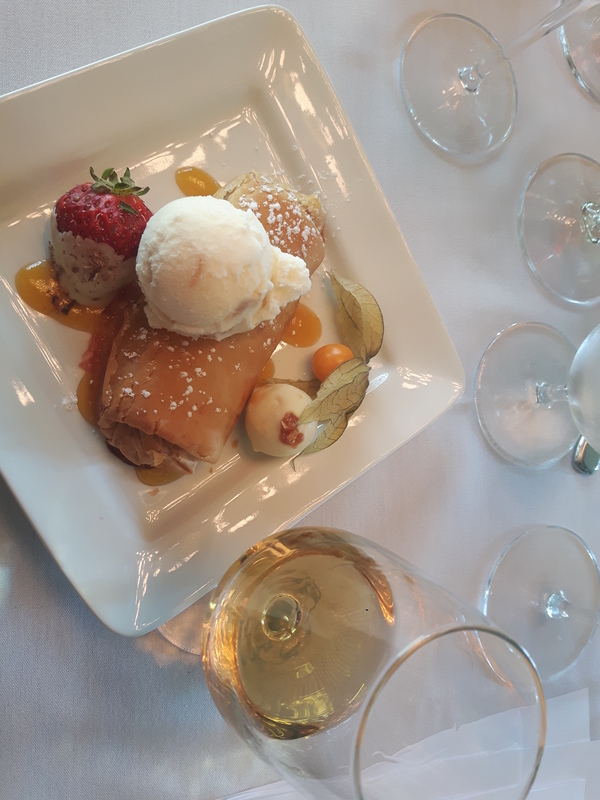 the 2005 Château Guiraud was served with our dessert of warm Apple Rhubarb Crisp. No, it wasn’t the most perfect pairing but on its own, this botrytised wine was certainly quintessential of Sauternes, and something I’m always happy to sip on when served! The balance of sweetness and acidity along with the noble rot are key to these wines. Dried apricots, honey, hazelnut, ginger, baked apples and pears with high acidity and full mouth filling body, and of course those aromas and flavours of botrytis, filled my glass and made my heart sing! A complex wine made from 65% semillon and 35% sauvignon blanc. And still time to keep and drink – up to 2020. Wonderful people, a scrumptious lunch and magnificent wines made my day! And then I found out I could buy these wines too? Yes please! The Clos du Marquis shall be gracing the shelf (alongside some of the other fantastic Bordeaux) before Christmas! Santé! This entry was posted in Tasting, wine and tagged 1855, aged, Bordeaux, botrytis, Cabernet Franc, Cabernet Sauvignon, classification, Domaines Delon, Family, France, Gironde Estuary, left bank, Medoc, Merlot, pairing, Petit Verdot, Pomerol, right bank, Saint Julien, Sauternes, Sauvignon Blanc, Semillon, tasting, vintage. Bookmark the permalink.